Also, Fanny Mendelssohn: Songs. 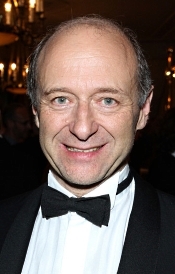 Anna Lucia Richter, soprano; Barbara Kozelj, alto; Pro Musica women's choir; Ivan Fischer, Budapest Festival Orchestra. Channel Classics CCS SA 37418. At the risk of making this review more about me than the music, let me start with a comment about myself anyway. I first started listening to recordings of Mendelssohn's A Midsummer Night's Dream in the mid Sixties with Otto Klemperer's 1960 EMI LP. It was the familiar suite we hear on the present recording, and Klemperer remains my favorite. In the late Seventies Andre Previn recorded more than the suite, adding most of the interludes and connecting music. His album, also for EMI, was just as charming as Klemperer's and equally well recorded. It's still a favorite, too, and between them they have served as touchstones for the dozens of recordings of the piece I've heard since. 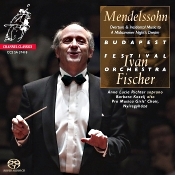 Which brings us (rather long-windedly) to Ivan Fischer's Channel Classics recording with his Budapest Festival Orchestra. It's as light and airy, as cheerful and delightful, as any I've heard. But even though it comes to us on a modern digital SACD, the sound doesn't have quite the clarity or balance of the old EMI (now Warner) issues. Still, it's nice to have so refreshing a new release as Fischer's. As you probably know, German composer Felix Mendelssohn (1809-1847) began work on his music for William Shakespeare's comedy A Midsummer Night's Dream as a teenager, composing the Overture in 1826 when he was only seventeen. Then he stopped, completing the work some sixteen years later in 1841 while employed by the Prussian court. It was here that King Frederick William IV suggested to Mendelssohn that he compose some complete incidental music for a new production of the Shakespeare play, and Mendelssohn complied since he had already written the opening tune. Maestro Fischer gives us ten of the most-popular selections from Mendelssohn's incidental music, starting, of course, with that early Overture. Fischer's way with the music is gentle and affectionate, almost consistently keeping it as light and airy as it should be. Indeed, this is, overall, the best recorded performance I've yet heard from Fischer, and he has always seemed to me more than competent. In this case, he's a real contender, and his Budapest players seem to have a genuine feel for the music. Throughout most of the other numbers, Fischer is quick and lively. This works in most cases, although his approach to the Nocturne tends to diminish some of its lyricism. Nevertheless, the sprightly vigor of the playing is a delight, and, as I say, practically everything dances along with unvarnished joy. Fischer's interpretation brings out all the humor, all the color, and all the fairy-tale qualities of the score. It's really quite charming. Oh, those "spotted snakes." Lovely. And, no, I didn't forget the "Wedding March." Under Fischer it projects all the exuberance of the occasion. Above all, though, it's regal and elegant, things some conductors forget as they get carried away in the heat of the moment. Accompanying the Midsummer Night music, we get three songs with orchestra composed by Fanny Mendelssohn (1805-1847), Felix's sister. Soprano Anna Lucia Richter, who sang the first fairy in the preceding Midsummer Night music, handles the solos. Because of the prevailing attitudes toward women in Fanny's day, Felix's music got all the attention. Fanny even had to publish some of her work under her brother's name. Fortunately, more of Fanny's music is coming to light these days, and we're more the better for it. Here, they are quite enchanting. Producer Hein Dekker and recording engineers Hein Dekker and Jared Sacks recorded the music at the Palace of Arts, Budapest, Hungary in January 2015. They made the disc for hybrid multichannel and two-channel SACD and two-channel CD playback. I listened in the two-channel SACD mode. The sound is quite nice. It's very dynamic, with a reasonably good depth of image for added realism. The stage width is not quite so wide as many competing recordings, yet it provides a lifelike perspective representing a moderate concert-hall listening distance. Ultimate definition is a tad lacking, but that, too, is not unlike what one might hear at a real concert as opposed to an entirely transparent audiophile studio effect. It's all warm and smooth and reverberant and easily listenable.